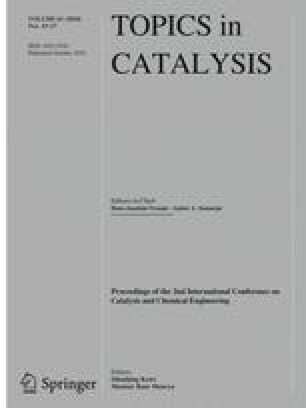 To address the mechanism of C–C bond cleavage on the metal surface of the M/SiO2 (M represents metal) catalyst is desirable and vital during the catalytic depolymerization process of lignin in solvents. Density functional theory simulation is used to determine the energy of C–C bond dissociation, adsorption geometry, adsorption energy and electronic structures of three kinds of the β-1 bond contained lignin model compounds (Mo1, Mo2 and Mo3), which were adsorbed on the (100) surface of metal (Ni, Cu, W) in the catalysts. The bond dissociation energy (BDE) of Cα–Cβ was found to be lower than those of Caryl–Cα and Cβ–Caryl bond. The Cα–Cβ in Mo2 was adsorbed via a π configuration on the Ni(100) and Cu(100) surfaces, exhibiting the weak dissociation bond energy. The –OH group was anchored as a η1(O) configuration which was instable on the (100) surface of W. The model compounds might be co-adsorbed with hydrogen on the metal surface under the reaction condition. The adsorption of Mo2 on the (100) surface of Cu was changed to the η1(O) pattern, while the Cα–Cβ BDE was declined on the (100) surface of Ni and Cu involving the coverage of hydrogen. The adsorption on W(100) had no effect on the decline of Cα–Cβ BDE. The adsorption of Mo2 on the (100) surface of metals plays different roles on weakening the Cα–Cβ BDE, giving conceptual guide for the selective depolymerization of lignin to specific chemicals. The authors greatly acknowledge the funding support from the projects supported by National Natural Science Foundation of China (Grant Nos. 51476034, 51676047 and 51628601), Natural Science Foundation of Jiangsu Province (project reference: BK20161423). This work is also supported by the Fundamental Research Funds for the Central Universities and Postgraduate Research & Practice Innovation Program of Jiangsu Province (project reference: KYCX17_0074).